4. Four Study Stages (Concept to Feasibility) – Which Should We Do? - KJ Kuchling Consulting Ltd.
Over my career I have been involved in various types of mine studies, ranging from desktop conceptual to definitive feasibility. Each type of study has a different purpose and therefore requires a different level of input and effort, and can have hugely different costs. I have sat in on a few junior mining management discussions regarding whether they should be doing a PEA or a Pre-Feasibility Study, or a Feasibility instead of a Pre-Feasibility Study. Everyone had their opinion on how to proceed based on their own reasoning. Ultimately there is no absolute correct answer but there likely is one path that is better than the others. It depends on the short term and long term objectives of the company, the quality and quantity of data on hand, and the funding available. In my opinion there are four basic levels of study, which are listed below. My objective to simply provide an overview of them. Detailed comparison tables are readily available, and anyone can contact me for an a full copy of the table shown below). This would likely be an in-house study, non-43-101 compliant, and simply used to test the potential economics of the project. 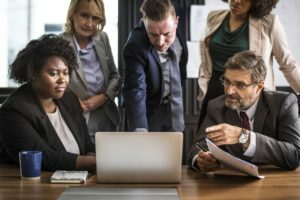 It lets management know where the project may go (see a previous blog at the link “Early Stage “What-if” Economic Analysis – How Useful Is It?”. I recommend doing a documented desktop study. It doesn’t take much time and is not made public so the inputs can be high level or simply guesses. This type of study helps to frame the project for management and lets one test different scenarios. The PEA is 43-101 compliant and presents the first snapshot of the project scope, size, and potential economics to investors. Generally the resource may still be uncertain (inferred classification), capital and operating costs are approximate (+/- 40%) since not all the operational or environmental issues are known at this time. Please do not sell the PEA as a feasibility study. I recommend not announcing or undertaking a PEA until you are confident in what the outcome of the PEA will be. A reasonable desktop study done beforehand will let a company know if the economics for the PEA will be favorable. I have seen situations where companies have announced the timing for a PEA and then during the study, have seen things not working out as well as envisioned. The economics were poorer than hoped and so a lot of re-scoping of the project was required. The PEA was delayed, and shareholders and financial analysts negative suspicions were raised in the meantime. 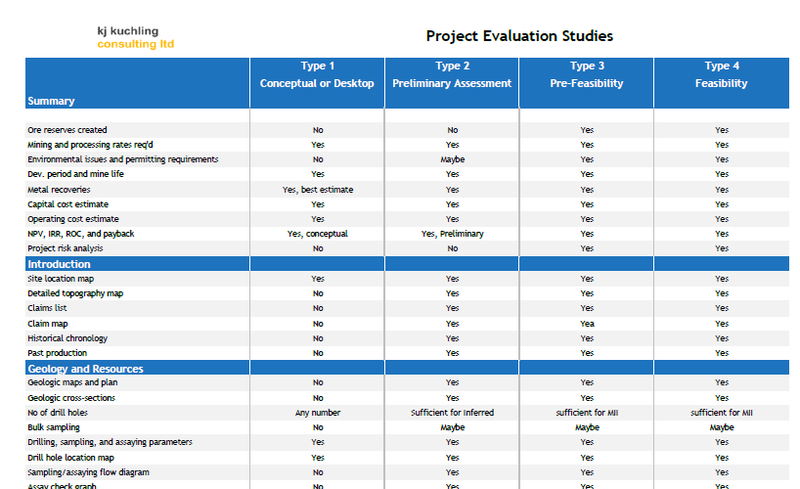 The PEA can be used to evaluate different development scenarios for the project (i.e. open pit, underground, small capacity, large capacity, heap leach, CIL, etc.). However the accuracy of the PEA is limited and therefore I suggest that the PEA scenario analysis only be used to discard obvious sub-optimal cases. Scenarios that are economically within a +/-30% range of each other many be too similar to discard at the PEA stage. The PFS will be developed using only measured and indicated resources (not inferred) so the available ore tonnage may decrease from the PEA study. The PFS costing accuracy will be better than a PEA. Therefore the PFS is the right time to evaluate the remaining development scenarios. Make a decision on the single path forward going into the Feasibility study. More data will be required for the PFS, possibly a comprehensive infill drilling program to upgrade the resource classification from inferred. Many companies, especially those with smaller projects might skip the PFS stage and move directly to Feasibility. I don’t disagree with this approach if the project is fairly simple and had a well defined scope at the PEA stage. The Feasibility Study is the final stage study prior to making a production decision. The feasibility study should preferably be done on a single project scope. Try to avoid more scenario analysis at this time. Smaller companies should be careful entering the FS stage since, once the FS is complete, shareholders will be expecting a production decision. If the company only intends to sell the project with no construction intention, they now hit a wall. What to do next? Sometimes management feel that a FS may help sell the project. I don’t think a FS is needed to attract buyers and sell a project. Many potential buyers will do their own in-house due diligence, and possibly some design and economic studies. Likely information from a PFS would be sufficient to give them what they need. A well advanced Environmental-Socio Impact Assessment may give as much or more comfort than a completed Feasibility Study would. My bottom line recommendation is that there is no right answer as to what study is required at any point in time. Different paths can be followed but consideration must be given to future plans for the company after the study is completed. Also consider what is the best use of shareholder money? Company management may see pressure from retail shareholders, major shareholders, financial analysts, and the board of directors. Management must decide which path is in the best longer term interests of the company. Tagged: 43-101, Cashflow Model, Feasibility Study, Mine Engineering, PEA, Project Manager, Study Management. ‹ 3. Site Visit – What Is the Purpose?